Gouvernement General de Provence, divise en ses Vigueries, avec les pays circonvoisins, le Comtat Venaissin, la Principaute d'Orange, et les terres adjacentes. 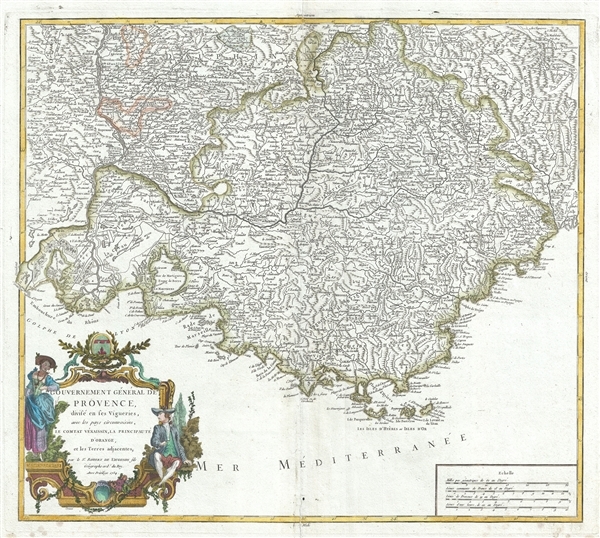 This is a scarce 1754 map of Provence, France by Robert de Vaugondy. It covers the southern coast of France from Nice to Saint-Gilles. The departments of Var, Gard, Bouches-du-Rhone, Alpes-de-Haute-Provence, Alpes-Maritimes and Vaucluse are included. Vaucluse is the center of wine production in the southern Rhone. Some of the smartest wines in France can be found here. There is also a very strong movement towards the adoption of organic and biodynamic viticulture and natural wine making. The area includes the Cotes du Rhone, Luberon, and Gigondas wine appellations, just to name a few. Var, the heart of the French Riviera or Cote d'Azur, includes the resort cities of Cannes, Nice and San Tropez, among many others. This area also houses a number of vineyards. Here you will find the AOC Coteaux varois en Provence, which produces a wide variety of reds and whites. The red wines principally use the grenache, cinsaut, mourvedre and syrah grapes. White wines use the clairette, grenache blanc, rolle blanc, Semillon Blanc, and Ugni Blanc. Gard is known mainly for its red wine and production of Bleu des Causses, a soft and savory cheese. The northern sub-region of the Bouches-du-Rhone region produces red wines from the Syrah grape and white wines from Viognier grapes. T he southern sub-region produces an array of red, white and rosé wines, often blends of several grapes such as in Chateauneuf-du-Pape. The map includes a beautifully engraved title cartouche in the top left quadrant. This map was drawn by Robert de Vaugondy in 1754 and published in the 1757 issue of his Atlas Universal. Very good. Minor wear and verso repair along original centerfold. Original platemark visible. Some spotting and offsetting with water stains near lower borders. Rumsey 3353.047. Pedley, Mary Sponberg Belle et Utile: The Work of the Robert de Vaugondy Family of Mapmakers, 161.